In the infinity of things it was probably inevitable that someone would take a closer look at renaissance paintings and think to themselves "hey, these are pretty whacky. 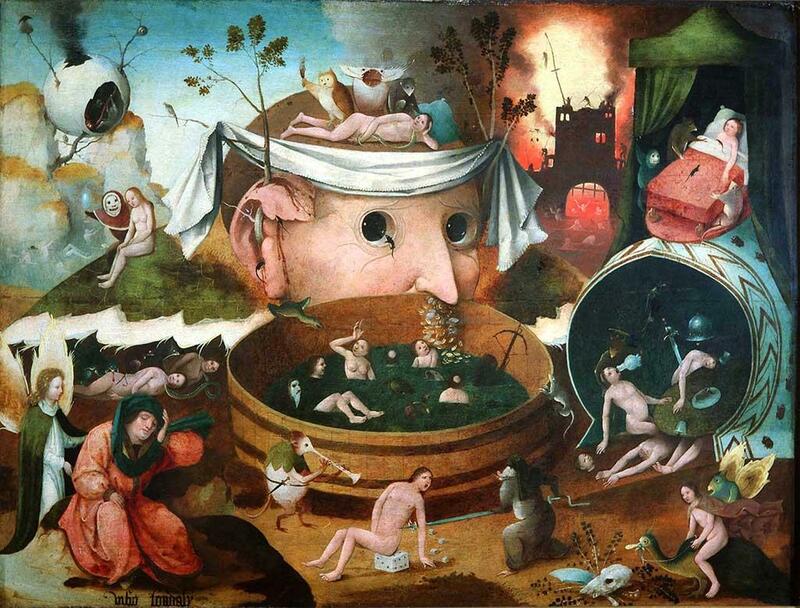 Wouldn't it be fun to make a point & click adventure game set entirely in these paintings?". That someone is Joe Richardson and that game is Four Last Things. It is exactly the kind of thing I would use as an example of something that is either a stroke of genius or completely bonkers - but Joe Richardson wasn't the only one who thought it was a good idea, as Four Last Things is a Kickstarter-backed game. Let me say this though - it is a good idea. I can't say I know much about art, or that I am overly interested either. I listen to an art podcast however so I guess that puts me slightly above average in interest-level even though it's more because of my massive interest in everything history and less about art specifically. In the end it really doesn't matter if you know or don't know anything about renaissance art when you play this game. 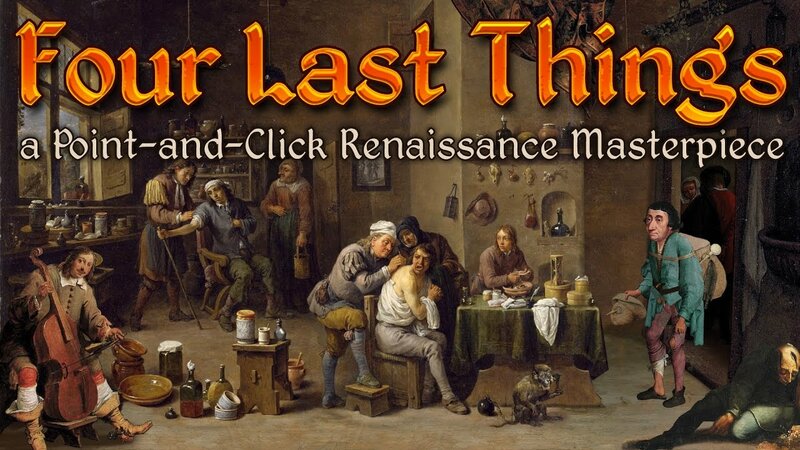 If anything, if you go into this purely because of your love for point & click adventure games, you are likely to come out of it with a curiosity of renaissance art. Because boy are they weird. Richardson seems to have been especially inspired by the works of Hieronymus Bosch (Four Last Things refers to a work by him), and it's not hard to see why. Just look up pretty much any of his artwork and you'll probably find a painting worth poring over for quite some time. Unless you know all the intricacies of renaissance symbolism, chances are they are going to make absolutely no sense. The game itself is not big, it only contains around two dozen different screens to interact with. Each screen is a patchwork quilt of paintings, with certain parts simplistically animated. Richardson has clearly realized how absurd the whole idea is, because this game does not take itself seriously. If you're worried a game about renaissance art is too high-brow to be fun, you can stop worrying right now. The wikipage says PC Gamer called it "Monty Python"-esque and that is definitely a very fitting description. The writing is surprisingly fun throughout and probably the games biggest strength. The story is simple but effective - you play as a character who has come to the church of Heavenly Peter, seeking absolution for having committed the seven deadly sins. The bishops tell you that the sins were done outside of their jurisdiction and so you need to re-commit them in order to be absolved in their church. Re-committing these sins is the entire game, meaning it is not very big, because we all know sinning isn't something that requires much effort. I finished it in 1,5 hours, admittedly I required some help for some of the puzzles meaning that if I had had the patience to try and solve them on my own the game would've probably lasted around twice as long. That is not to say the puzzles are particularly difficult or unfair, on the contrary - I found the puzzles some of the most well-balanced I've encountered in a point & click adventure in a long time. Even though I am a bit too slow-witted to figure them all out, you are definitely given the right type and the right amount of clues to figure out most of them without having to make big leaps in logical thinking, especially if you're accustomed to a point & click-think. While they range from silly simple (and this is also pointed out in the game) to trickier several-step puzzles, you won't find any red herrings here. I wouldn't have been able to figure out the riddle in a million years though. Looks overwhelming at first, just like good renaissance art should. Each screen is accompanied with its own classical renaissance-tune, played by some character or characters in the screen. Each tune is mostly just a short jingle on a loop and I can understand why Richardson thought there needed to be a lot of variation, because every single tune wears on your ears pretty quickly. Fortunately you don't spend enough time in each screen nor with the game to become too annoyed by it (big ear-worm warning here though). You control your character by (surprise surprise) clicking on objects in the surrounding that are interactable, this gives you an action-wheel a la Full Throttle to either use (hand), talk (mouth) or look (eye) at or with something. Your items are handled in a drop-down menu. This works very well but you will find yourself with little reason to look at things (other to hear the witty description of it) and you won't pick up and handle many items. Most of the game is solved by talking to people. Unlike with some other P&C games I never struggled to find what objects were interactable nor where I could go next. I did encounter a bug of some sort where I wasn't able to interact with anything in the screen. Right-clicking makes your character do a somersault (to no apparent use in the game as far as I could tell) and only after doing that did the controls work again. I have no idea if this is working as intended, but it only happened twice and was barely an inconvenience. In the end the Four Last Things comes out as something I am glad I have spent some time with. It's entertaining, and dare I say maybe even a bit educating. 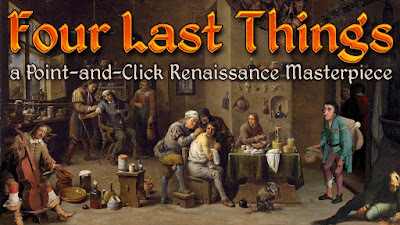 If you're into odd video games, renaissance art and/or point & click adventure games you could do worse than to spend a few hours with Four Last Things. It doesn't have much, but what is there is unconventional, witty and well-designed. And there is something to rewarding an oddball idea such as this one with your time and money. Methinks I'm going to have to check this out sometime. Perfect for that time when you think "I have no idea what I want to do".